Elaine is a comfortable lounge seat with a large sitting surface made from a woollen rug. 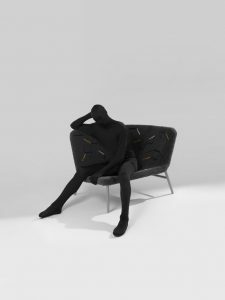 This seat is the result of a close collaboration with ourselves and Dutch designer Julie Thissen, which took place in 2016-2017. 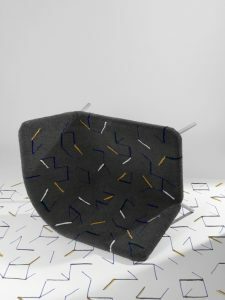 Elaine is part of the project ‘A fine Yarn’, which was initiated by the designer Francesca Sciarmella, aiming to form connections between young designers and Irish industry to find new applications for traditional Irish wool. The surface of the seat is made by hand, using a rug production technique known as gun-tufting. 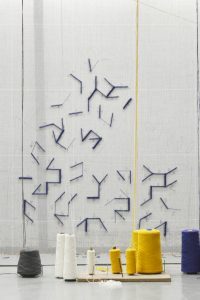 This technique allows rugs to be produced in any specific given shape just like a tailor’s pattern. 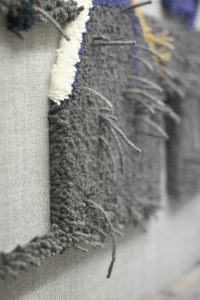 The rug is then stitched into a shape and finally it is fitted and attached to its metal structure. It wraps around the frame, creating soft edges and corners on all sides of the seat.